6′+ Episode 12 is Up! Fans of old time horror radio all know that Suspense is considered as one of “top dogs” of horror radio dramas. What they might not know is how the show has a British counterpart. When I say “counterpart,” I’m not referring to a show with similar stories and popularity; I’m referring to an official adaptation! 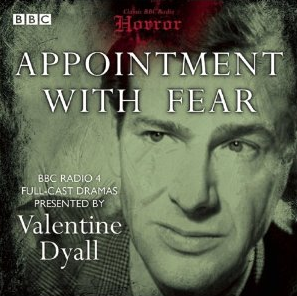 Debuting a little over a year after its American equivalent premiered, Appointment With Fear made a strong start with its adaptations of John Dickson Carr’s Suspense scripts (later branching out into original material) and its choice of Valentine Dyall (Best known to Americans as the Black Guardian from Doctor Who) as the show’s host “The Man in Black.” The series was a huge hit and spawned several motion pictures and even a spin-off radio series! Disc 1 starts off with John Dickson Carr’s adaptation of Edgar Allan Poe’s classic story “The Pit and the Pendulum.” While remaining quite faithful to the original tale, Carr expands upon and adds certain details to the story. While the original simply started us off with the prisoner suffering from his torture, the radio version has him on trial by the Spanish Inquisition for blowing up a church where the Spanish army was storing gunpowder and then moves on to the events depicted in Poe’s tale. He also cleverly added in hallucinations of the prisoner’s wife in order to prevent the script from turning into the main character simply narrating all of the events. Sound is especially well used here. The chanting of the Inquisition in the background, along with the echoes in everyone’s voices, nicely convey the dungeon setting. The sound of the swinging pendulum, coupled with the frantic tone of the hallucination of the wife add a great deal of suspense as well. Another narrator introduces Carr’s “The Speaking Clock” (a remake of an episode of Suspense called “Mr. Markham, Antique Dealer”), although the Man in Black does narrate the opening of the tale itself. In it, we meet an antique dealer named Charles Markham, who runs a very profitable side business…blackmail. When a woman who comes into his store seeking a last minute present turns out to be a victim of his who wants to get rid of him, things get interesting. And when another party enters the picture and a murder occurs, things get even more interesting, especially when the murder victim claims that he will return within a half hour…and does. Between all the twists and turns of the plot and the hilariously nasty villain, this is one heck of ride. Disc 2 starts of with another Carr script “The Clock Strikes Eight.” Although the Man in Black is back as the narrator, he turns over the bulk of the storytelling duties to his guest, Dr. Fell. The good doctor tells us the tale of the Barton Case, which involves the pending execution of one Helen Barton for the murder of her fiancee. The problem is that she claims to be suffering from amnesia, but nobody believes her. When her memory apparently returns a few hours before her scheduled death and she claims innocence, things get complicated. Even moreso when her fiancee’s brother is seen prowling outside the prison. As was the case with the other time-related episode, there are plenty of twists and turns here. That said, this is an excellent release. The liner notes provide an in-depth look at the history of the series, including pictures of vintage magazine ads for episodes of the series. Sadly, this will most likely be the only release of episodes from Appointment With Fear. This is because these are the only four episodes that survived the BBC’s infamous practice of “wiping” shows (both radio and television) in order to save money on storage (among other issues). This is also the reason why sometimes audio issues, such as static and hissing, pop up in the episodes presented on the disc. In case you were wondering, “The Pit and the Pendulum” is from 1943, “The Speaking Clock” was the 1944 third season opener while “The Clock Strikes Eight” was the closer for that season, while “And The Deep Shuddered” was from the sixth season in 1945. Given the successes in recovering several lost episodes of Doctor Who (along with episode reconstructions using fan-recorded audio), I remain hopeful that further episodes will be recovered someday. Although I don’t know for sure if Appointment With Fear ever received airplay out of the UK, I can easily imagine transcontinental pen pals swapping “taped off the air” recordings of it or authors who had their works adapted on the show having copies of shows stashed away among their personal possessions. As the program does not seem to be included in the BBC Archive Treasure Hunt, I’m officially putting out the Bat Signal for all of our readers. If you have any episodes of Appointment With Fear that were not mentioned in this review, please contact the BBC, AudioGo or Gravedigger’s Local 16 as quickly as possible.